Understanding the needs of a luxury hotel is one thing, anticipating their requirements is another. We like to work in collaboration with our hotel clients, seeing our role as part of a valued team. Invariably it’s necessary to work to very specific brand guidelines while at the same time provide an innovative design response to design briefs. 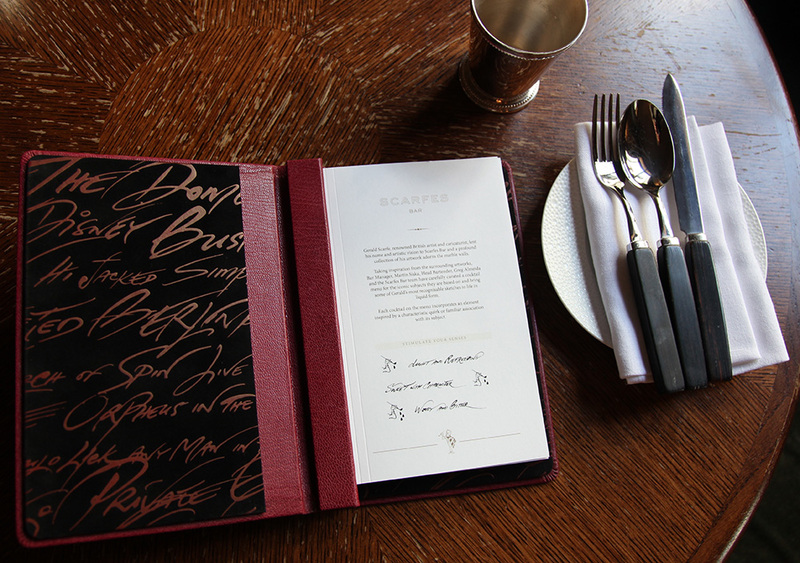 This particularly applies to an area that every hotel has significant ongoing requirements for – menus. This page covers a series of projects which respond to exactly this sort of project with finished design pieces that are eye-catching and chic. One of the most significant challenges we come up against time and again is the need for design work that is both beautiful as well as being, dare we say it, practical. With every product being used many times a day, wear and tear soon shows – and if there’s anything that not premium it’s a dog-eared piece of print. So we work hard to ensure our printed documents can stand the test of (at least a little) time. Brand culture is at the heart of a luxury hotel – everything they create must align with this. However, this output can neatly be divided between the customer-facing and corporate world. Marketing led client-cantered design tends to be handled centrally, often by a large design agency who follow a set pattern of brand guidelines as the hotels are rolled out internationally. However there’s another requirement of work which we’ve recently been focussing on – the need to staff the best hotels with the best people. 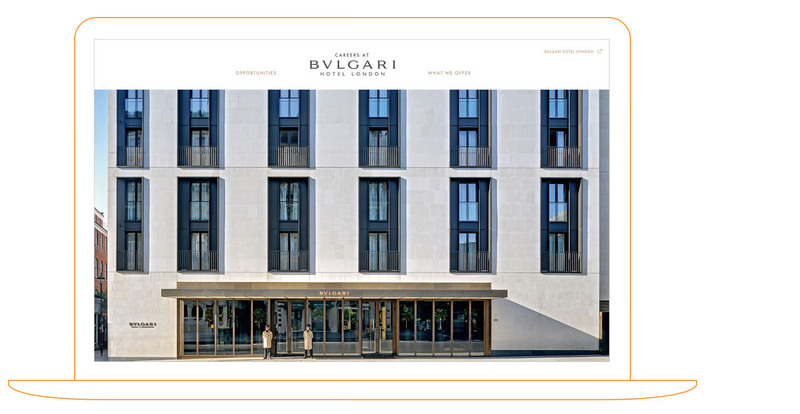 This digital project for the Bulgari Hotel in London’s Knightsbridge is one such example. We were approached by the HR team at the Bulgari who needed a stand-alone website listing all available job opportunities at the hotel. The core values of the Bulgari brand were central to our design approach. As they say at the hotel, ‘the team are the living embodiment of their brand’. 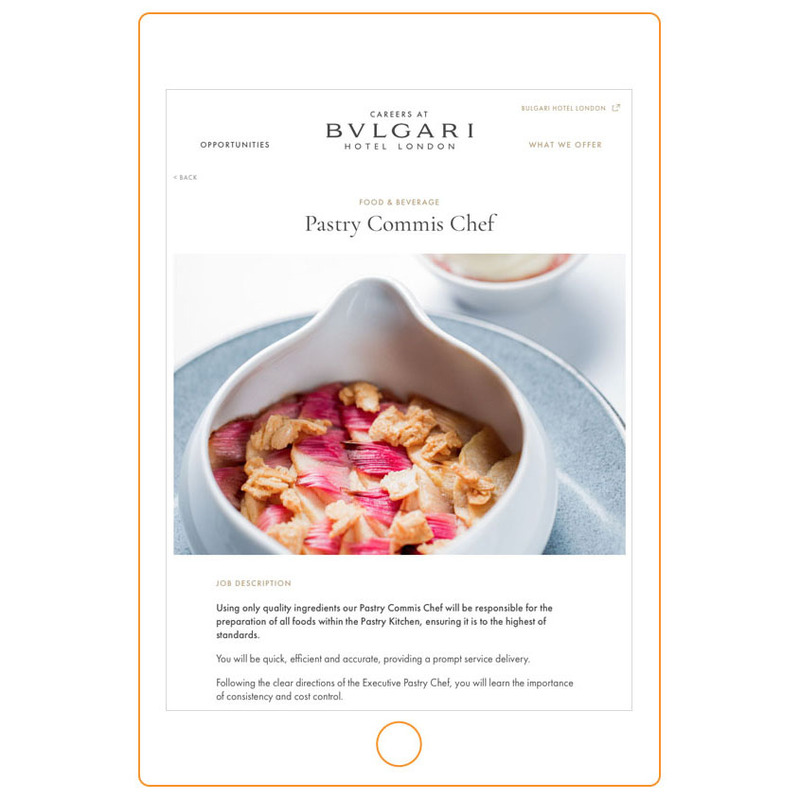 Technically, the website is built with a totally custom design which matches the Bulgari brand and sits in creative lock-step with the customer-facing website – and indeed links to it. The site has been built to be totally responsive, working across every platform. It also has a customised, easy-to-use WordPress editing facility. This simplicity is incredibly important given the busy nature of the hotel and its constantly changing staff requirements. 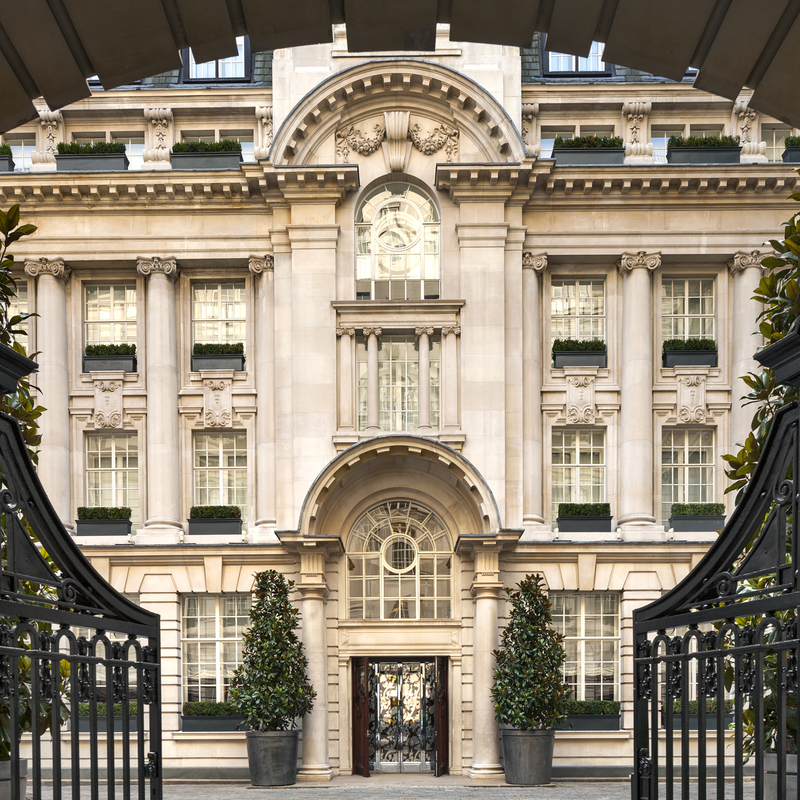 Based in Holborn amid an Edwardian Grade II-listed building, Rosewood London is is one of the finest five-star hotels in the capital, blending English heritage with contemporary sophistication. 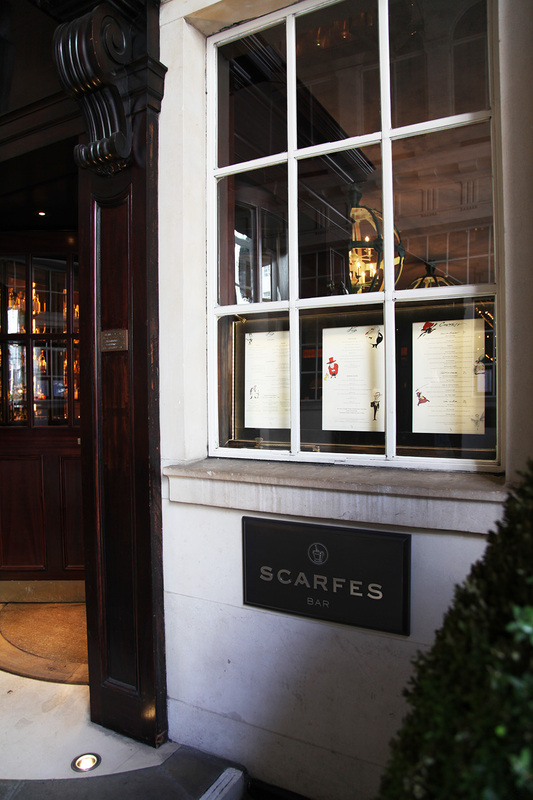 Our work for Rosewood began with the beautiful new leather-bound menus for Scarfes, London’s finest cocktail bar, that was nominated for a 2017 Solutions Award for Best Design. We have also created a pair of menus for the elegant Mirror Room using cool grey tones and a silver blocked design for their All-Day Dining and Art Afternoon Tea menus. Additionally we have created digital marketing products in the form of HTML emails built inside the pre-existing Rosewood system to their brand guidelines. London Base provide a fresh approach to modern tourism. A startup some two years old, they offer a short let service for elegant premium apartments across London. As London Base launched, we were commissioned to develop from-scratch branding for the business that echoed something iconic of our legendary city. We chose the door knocker of No.10 Downing Street – which has now appeared on printed stationery and their launch website. More recently London Base asked us to work up a series of customer-facing, elegant folders which contain all the background detail to their properties. 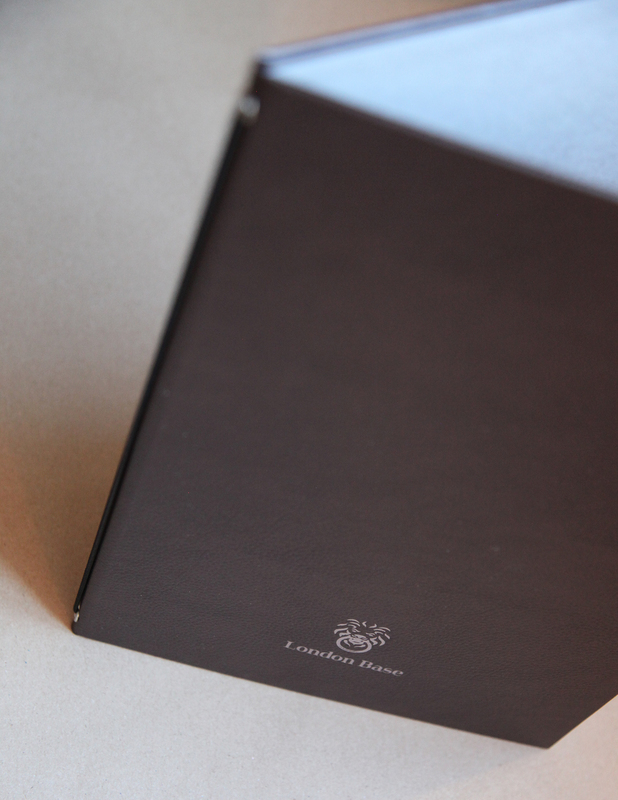 These exquisite binders are wrapped in chocolate brown leather and stamped with the branding using a silver foil emboss. Our work in the hotel industry extends beyond the hotels themselves, but also ancillary businesses who offer services such as PR and Marketing. 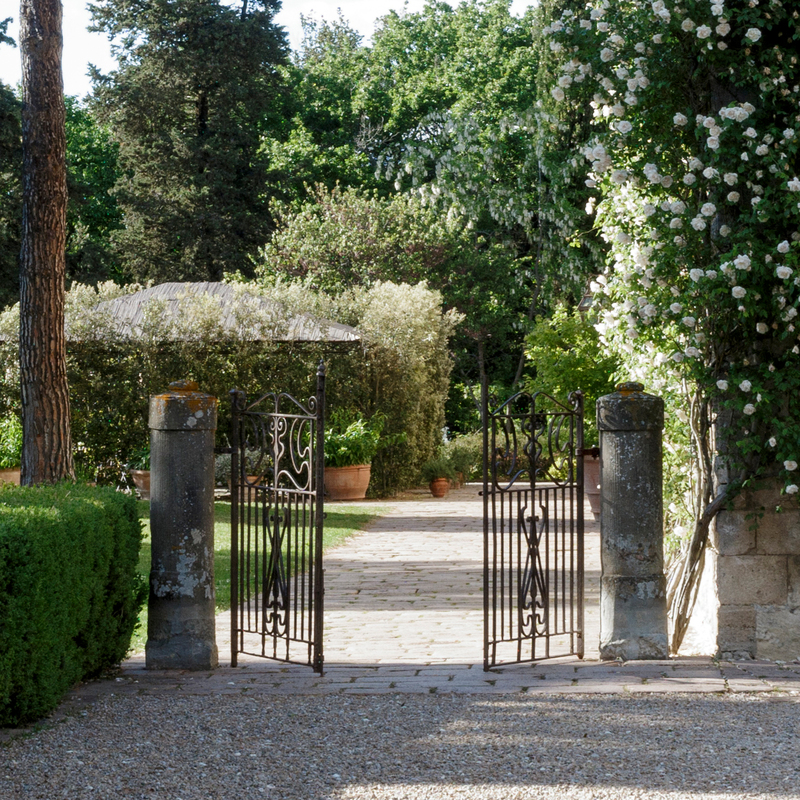 A great examples of this is Italian hotelier Flavia Brutti Righetti, the founder of FBR Luxury Hotel Consulting. Since FBR launched we have completed a wide-ranging set of work for the business starting with the development of its visual identity and the extension of that to a portfolio website. The FBR website includes a stunning portfolio of each hotel the company represents, including long-form pages with a range of outstanding promotional photography.